Greg Cook watched a stations of the cross procession today in the South End, recreating Jesus's sentencing, death march and resurrection. Greg Cook was one of several hundred people at a vigil for the victims of the latest white-nationalist mass murderer, this time in New Zealand. 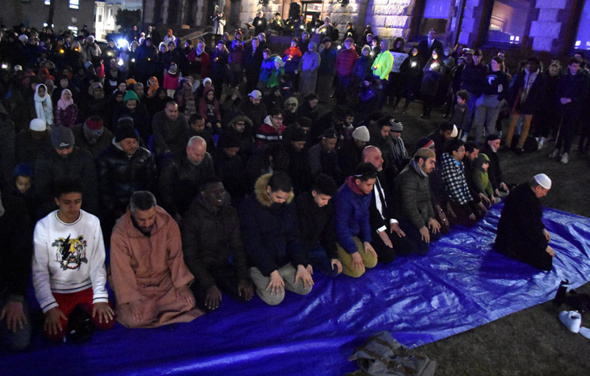 He listened as Farida Moustafa, a 16-year-old student at Cambridge Rindge and Latin said that it could just as easily have been her and her family there. He also watched as people kneeled to recite the evening prayer. The Jewish Journal talks to Debbie Cherry, president of Temple B’nai Israel, the last remnant of what was once Revere's large Jewish community - which she is now preparing for sale. A Suffolk Superior Court judge yesterday convicted Sean Devlin, 35, of North Reading, for a 2017 incident on the Orange Line in which he screamed anti-Muslim slurs at a hijab-wearing woman returning home from a prayer service and then attacked her as she fled the train. Read more. 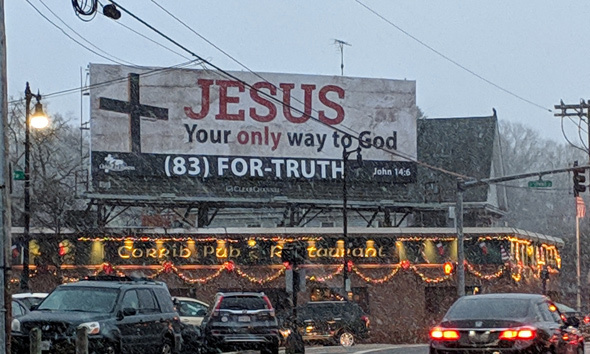 A billboard that declares only Christians can know God has blown up West Roxbury and Roslindale Facebook groups over the past couple of days, with posts from people saying we all need more Jesus in our lives alternating with posts with non-Christians and others who object to the in-your-face-message and posts from people who say everybody should just get over it. Read more. 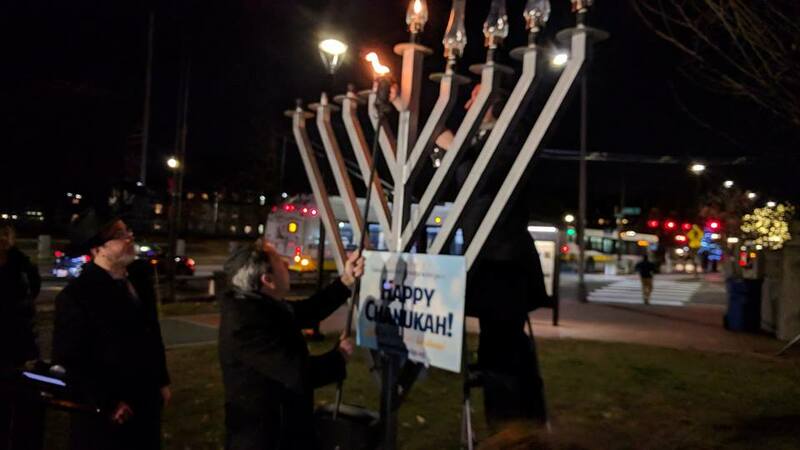 Ron Newman attended a ceremony on Cambridge Common tonight where residents and officials honored the people who put a large menorah back up Sunday afternoon after some guy on a bike went to the effort to knock it down. Read more. The Globe reports 14 members of the group IfNotNow were arrested for a sit-in at the Mass. Republican headquarters on Merrimac Street. Read more. Jefferson Beauregard Sessions was in town today for a little chat with a local chapter of the Federalist Society, which has been busy preparing lists of judges for Trump to appoint. Religion New Service reports on an attempt by two local ministers, one from the First Baptist Church in Jamaica Plain, to try to remind him what the Bible says about religious liberty. 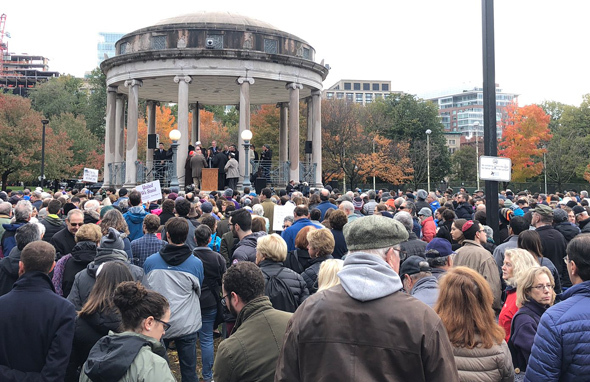 Carpundit was among the hundreds at the Parkman Bandstand to honor the memory of the Pittsburgh synagogue victims and to stand in solidarity with the survivors. Several Boston-area Jewish groups are organizing a vigil at the Parkman Bandstand at 2 p.m. on Sunday, following today's murder of 11 by an anti-Semite with an AR-15: Read more. 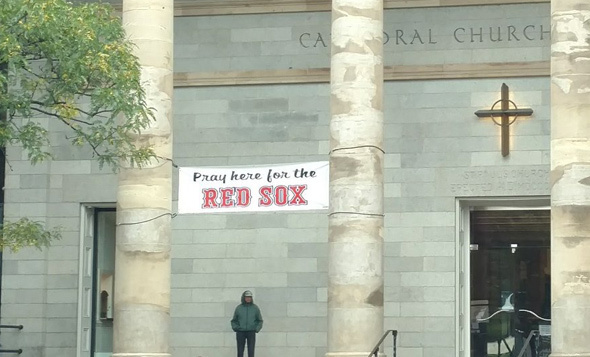 Craig Caplan spotted the banner on the Cathedral Church of St. Paul on Tremont Street this afternoon. From Shurtleff's request to the city. 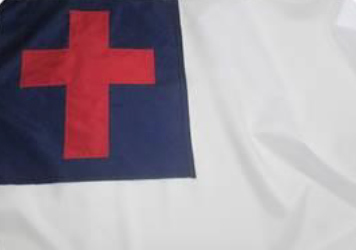 Hal Shurtleff, a West Roxbury resident and former John Birch Society member, is suing the city for refusing to let him fly a flag with a prominent cross on on one of the three flagpoles at City Hall Plaza for a pro-Christian event he wants to hold on City Hall Plaza on Sept. 17. Read more. Cardinal Sean O'Malley today announced changes at St. John's Seminary in Brighton: Read more.